The promotional period runs from 00:01 BST to 23:59 BST, on Sunday the 21st of April 2019 only. 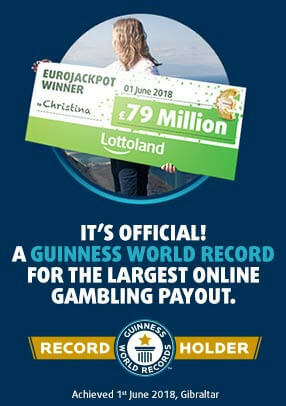 In order to qualify for a reward, you must be logged in to your Lottoland player account and click on ‘Deposit Here' (on the SMS link, Email link or on the online pop-up) during the qualifying period. You must then make a single deposit of a minimum of £100 to ensure the Bonus is applied to your account. Only payment methods that instantly credit money into the players account qualify for this promotion. Payment methods with a lead time do not qualify. Once you have deposited, you will receive a Bonus of £20 valid on all Lotteries. You must bet the entire sum of the Bonus 1 time on any Lottery before you can withdraw any winnings. For example, if you deposit £100, you will be awarded a £20 bonus. You will then have to bet the £20 bonus 1 time on any Lottery. The Bonus will expire 7 days after being credited. The offers can be redeemed up to 1 time within the promotional period. Participants, whether individually or acting in a group, will be found to be in breach of these Promotional Terms if Lottoland has reason to believe that a promotion has been abused, manipulated, or that irregular, fraudulent, collusive or illegal activity has occurred. Lottoland reserves the right to amend or withdraw any promotion at any time and without prior notice. Any amendment or withdrawal of a promotion will not affect any rights you have accrued prior to such amendment or withdrawal.